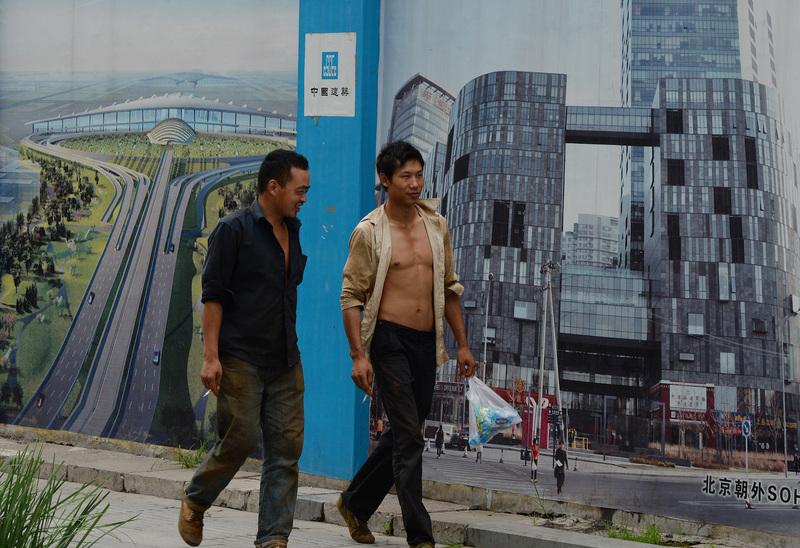 Chinese construction workers pass property development billboards in the Central Business District in Beijing on July 26, 2013. Decades of expansion have given China skyscrapers and high-speed railways, but brought piles of debt and dubious financial instruments analysts say could collapse and strike a blow against global growth. By Liu Ran and Wu Hongyuran, Caixin staff reporters. This article was first published by Caixin. As China's economy slows and defaults rise, 'bad loan' managers say they spot an opportunity to pick up bargains, because lenders are eager to shed toxic debt that might otherwise poison the broader financial system. Yet questions remain about whether these bad loan managers—especially smaller private players—are savvy investors in distressed assets or a risky backdoor for lenders to cleanse their balance sheets at a high cost. From May 2012, after the banking regulator gave the green light to set up local asset management companies (AMCs), 27 provincial-level ones have sprung up: many of them are backed by private investors, data from the China Banking Regulatory Commission showed. Caixin looked at company registration documents and found that private investors have a controlling stake in AMCs in provinces such as Anhui, Jilin, and Ningxia, and smaller stakes in state-backed entities in Hubei, Shandong and elsewhere. Header Asset Management Co. in Tibet, which was registered in early July, is so far the only local AMC that is wholly owned by a private investor. Caixin also learned from informed sources that prefecture-level governments are looking to set up their own AMC-style vehicles to unlock the frozen market for disposing bad debt. Trust firms, brokerages, and private investors have been lured into picking distressed assets, after the central bank the People's Bank of China opened up the sector in 2013, because banks are selling their non-performing loans at fractions of face value, and AMCs are expecting to earn big when asset values rebound, a source from Everbright Securities said. Banks are trying to whittle down soured loans by selling them for 32 percent of the original value, down from 43 percent in 2014, a manager at a government-run AMC in the eastern province of Zhejiang said. They are also eyeing to copy the model of the big four bad-loan managers set up by the central government—China Oriental Asset Management Corp., Cinda Asset Management Co., Huarong Asset Management Co. and Greatwall Asset Management Corp—and expand into a broad range of financial services including trading in non performing loan-backed securities, futures, and other debt-linked derivatives. Some already have tapped the lucrative property development industry, using land used as collateral in loans they have acquired. Caixin learned from people with knowledge of the matter that the central government will allow these bad-loan managers to play an important role in its proposed scheme for banks to swap loans for equity stakes in companies that owe them to prevent defaults. By the end of March, Chinese banks sat on non-performing loans worth 2.1 trillion yuan (U.S.$316 billion), or just over 2 percent of the total lending amount. But a state bank executive told Caixin that another 5 trillion yuan worth of loans have been placed under special supervision because there was a high probability that they could turn sour. A source from a local AMC who wished to remain anonymous estimated this year’s bad loan pile available for AMCs to dispose of will reach 3 trillion to 4 trillion yuan. But as China tried to get to a grip on its credit woes, questions about the ability of small regional AMCs to deal with the non-performing loan elephant remained. In 2015, the four central government-backed AMCs bought 80 percent of the 368 billion yuan worth of sour loans sold by lenders, while only 5 percent went to their smaller regional counterparts, data from Cinda, one of the big four bad-loan managers, showed. Adding to their woes is the fact that “banks will manage the non-performing debt that can be easily disposed of in-house and those transferred (to AMCs) cannot be easily sold,” said a bank source. A regional AMC source complained the big four rivals far outpaced the regional ones in terms of access to capital and business experience. “Banks are more willing to work with the four central-government backed AMCs. Smaller players hardly get good assets,” another commercial bank executive said. Regulators also have put more restrictions on regional AMCs. While the big four could dispose of their bad loans by liquidating them, swapping debt for equity or reselling it, local AMCs had limited means of disposal and had to restructure assets carefully before selling them. Investment bank China International Capital Corp. said in a recent report that local AMCs eventually will grab one-fifth of the distressed asset management market. Their close ties to local governments and access to private capital are their advantages, said a local AMC source. Regional governments usually preferred to partner with local AMCs rather than the central government-backed ones because it gave them more control over cleansing the balance sheets of troubled local SOEs, a source from Merchant Securities said. But lack of transparency has fuelled a lingering suspicion that local AMCs are being used by debt dodgers with close links to regional governments to avoid repayment. Last year, a city government in the eastern province of Jiangsu ordered a bank to sell 10 billion yuan worth of sour loans owed by state-owned enterprise to a local government-backed AMC for only 220 million yuan, sources said. The AMC later resold the assets to the original debtor for 250 million yuan. This means the debtor paid 30 million yuan to wipe-off a loan worth billions by recycling it through a bad-loan disposal company. To avoid such abuses, local governments should avoid interfering with banks' loan disposal decisions, said Pu Xiangrui, chief legal advisor of China Banking Association. Despite gaps in oversight of regional AMCs, Caixin learned from sources close to the banking regulator that at a recent internal meeting, the commission had discussed ways to expand the involvement of local bad-debt disposal businesses in a non-performing loan asset securitization pilot in an effort to rein in the troubled credit market.